TactiBite is better—and smarter—than a fishing lure. It mimics the vibrations and sounds feeding fish make, attracting curious prey fish. They detect the vibrations through the tiny hairs on their body. It works in salt and fresh water, with adjustable sounds and volume for different surroundings. Dimensions: 3.5" x 3.5" x 7.8"
Better than a fishing lure, this fish attractor emits sounds and vibrations to spur the fish’s curiosity. Toss TactiBite in the water near where you cast. It uses a tactile transducer (sort of like a speaker) to replicate the sounds and movements of feeding fish. Nearby fish detect the vibrations through tiny hairs lining their body. Normally those hairs help them locate prey and stay in their schools. In this case, the fish are spurred to move toward your bait. Maker Jack Danos already had a knack for fishing, but he taught himself 3D modeling to channel his passion into a useful prototype when he was just 15 years old. This would eventually land him an appearance on Shark Tank and a following of loyal customers. 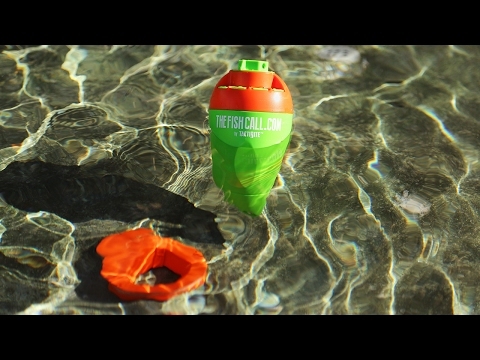 TactiBite comes with three sounds and adjustable volume, so you can properly attract the fish in different settings. Jack recommends using the “Scared Shrimp” for salt water and “Rattle Battle” as your go-to fresh water sound. Whichever sound you choose, this innovative fishing technique will have the fish moving—and biting—in the right direction.